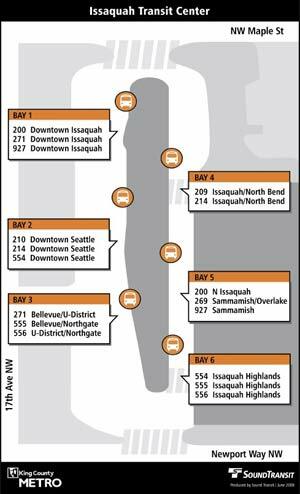 There will be new boarding locations for Metro routes 200, 209, 210, 214, 269, 271, 927 and ST Express 554, 555 and 556 at the Issaquah Transit Center (formerly the Issaquah Park-and-Ride) located on State Route 900 between Maple Street and Newport Way. Starting May 31, passengers should board at the new transit platform located between the construction area and SR 900. Bus riders can still park at the Tibbetts Park-and-Ride south of Newport Way or in the interim lot on the west side of SR 900 until Sound Transit opens the new transit center garage later this summer.